After four years of offering leadership training in the healthcare sector, CareerEdge learned from manufacturing employers that they too were struggling with promotions and the development of quality leadership. 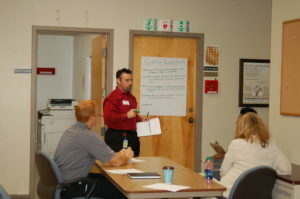 This discussion led to the launch of a new Emerging Leadership Training program for manufacturing companies. The program is helping employees in new leadership roles learn the soft skills needed to succeed, and was delivered by trainer Lori Ann Roth, the president of Learning and Reflective Growth for Individuals and Teams.